« Not the Booker prize, but something to B.R.A.G. about? Last year I entered a story in the Writing Magazine 2013 New Subscribers’ Short Story Competition. Not being a natural in the short story writing department, I’d given it a go anyway. Writing in a mode that’s difficult for you is excellent practice and really exercises your writing muscles. I didn’t hear anything further, so shrugged my mental shoulders and forgot about it. 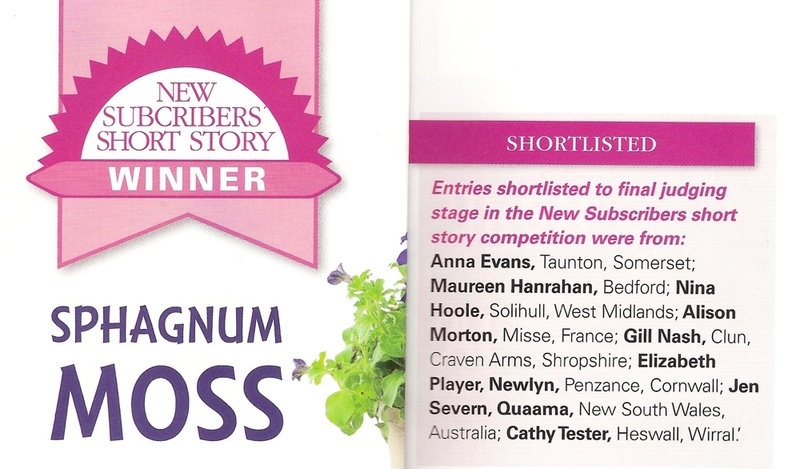 When I opened the 2015 competitions supplement enclosed with the recent Writing Magazine, I glanced through it and found the winning story (Sphagnum Moss), then spotted my name in the box with the shortlistees’ names. That is really exciting news, Alison. I haven’t even opened the Competition supplement in Writing Magazine as I never go in for them. You’ve quite inspired me to maybe have a go. Very well done. They have hundreds of entries for these sorts of competitions. Shows you can add short story writing to your amazing series of Roma Nova novels. Brilliant! Thank you, Denise. Nobody was more surprised than I was! Thank you! And huge congrats to you on winning the HNS Conference Short Story competition.